I am impressed with its upside breakout in February. Fundamental analysts looking at San Francisco-based Okta, Inc. (OKTA) recently seem to be impressed with its revenue growth, but I am impressed with its upside breakout in February. Prices were unable to sustain themselves above $32 but OKTA finally overcame whatever selling was around. Prices surged to $42 from the breakout at $32 and have been consolidating in the $38-$40 area in recent weeks. In this daily bar chart of OKTA, below, we can see that the volume of trading has expanded since December - a positive. Prices are above the rising 50-day moving average line and the rising 200-day line. Overall, the daily On-Balance-Volume (OBV) line shows a positive direction the past year but the move up in January is bullish and the correction since March looks "within industry standards." The Moving Average Convergence Divergence (MACD) oscillator is crossing to the upside from above the zero line - an outright go long signal. In this weekly bar chart of OKTA, below, we have less than our three-year window. Prices are above the rising 40-week moving average line. The weekly OBV line is positive and the MACD oscillator on this time frame is bullish. 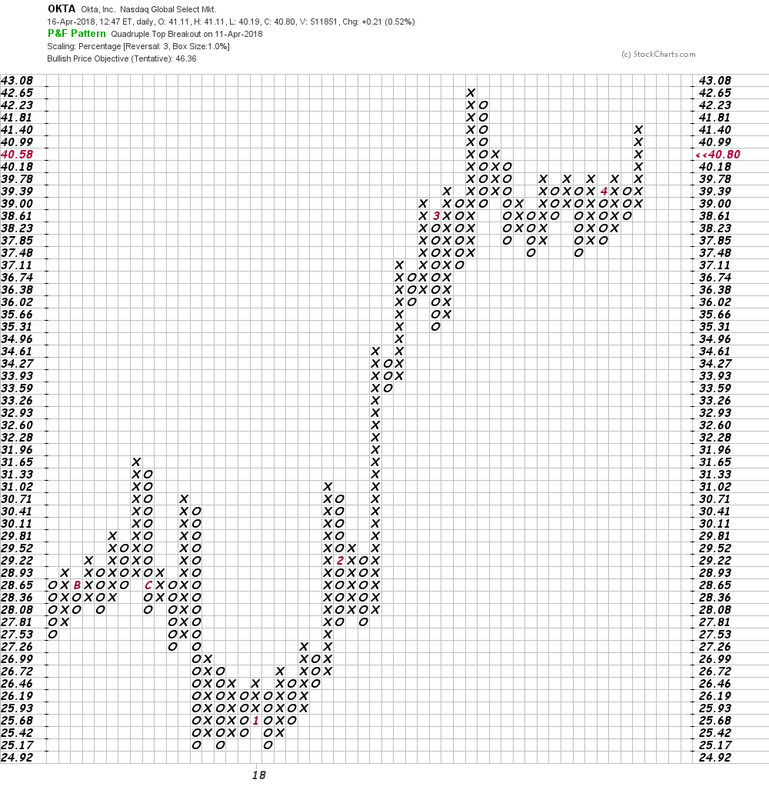 In this Point and Figure chart of OKTA, below, we can see a bullish pattern with an upside price target of $46.36. Bottom line: OKTA looks poised for higher prices. Traders could go long on strength above $42 risking below $37.